Do you want to experience fun and excitement through a carnival-themed event in a multi-awarded eco-friendly condominium? 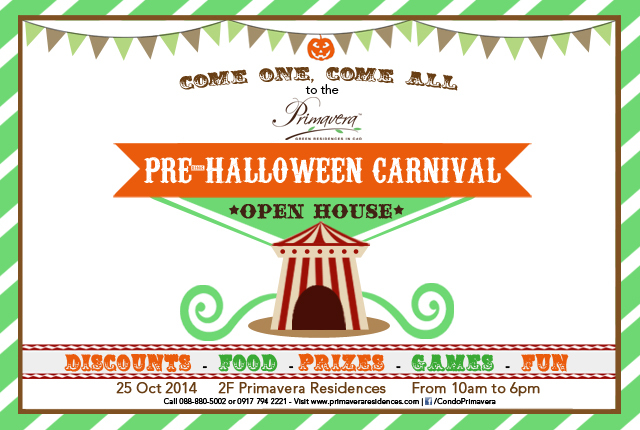 This month, Primavera Residences offers guests with food, games, discounts and prizes in one exciting day. As the Halloween season approaches, Primavera Residences will hold its pre-Halloween open house on October 25, Saturday, from 10am to 6pm. The green building invites guests to drop by and enjoy fun-filled activities and huge discount offerings for October. Guests will also get a chance to avail of Primavera Residences’ OCTOBER FEVER promo that entitles buyers to get savings of up to P100,000. For a limited period, the few remaining units at Primavera Residences Towers 1 & 2 will be equipped with a FREE kitchen modular system. Primavera Residences’ developer, Italpinas Euroasian Design and Eco-development Corporation (ITPI), an Italian-Filipino real estate firm, specializes in green architecture and design which brought the company’s CEO and architect to represent the Philippines in this year’s World Architecture Festival in Singapore. The 10-storey twin towers are equipped with energy-saving features such as cantilevers that protect the units from direct sunlight, thereby reducing temperature inside the building, and an indoor courtyard that maximizes natural ventilation and lighting. Solar panels will also be installed at the roof deck by June 2015 to power the building’s common areas. The green building is also designed to withstand earthquakes and extreme weather conditions. For inquiries about the Pre-Halloween Open House event and about Primavera Residences, visit www.primaveraresidences.com or call (088) 880-5002 or 0917-794-2221.